Information updated to reflect 2019 tour dates. Hey everyone, Katie here again for iHeartHsv on a beautiful Spring day in Huntsville. Today, I’m strolling around historic Twickenham to learn about Huntsville’s past! 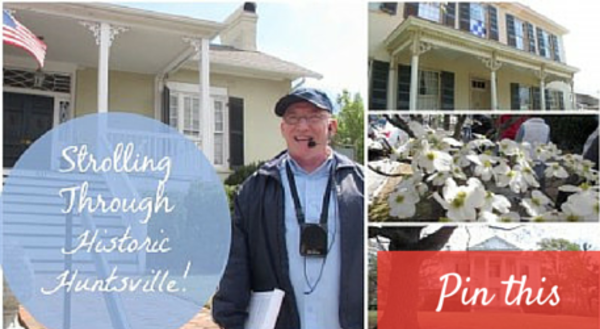 During the Spring and Fall, the Huntsville/Madison County Convention and Visitors Bureau organizes guided walking tours around different areas that focus on local history. I attended the first walk of the Spring season through the Twickenham district, guided by the CVB’s own Van Brown! Van is an absolute font of knowledge about the homes themselves, as well as their previous owners, and I love that he adds little tidbits about his experience growing up near Big Spring Park. We met at 10 AM at Alabama Constitution Hall Park, and the tour lasted about two hours, so definitely plan on wearing comfortable shoes! We learned about the painter Maria Howard Weeden, the "Spite House," a disastrous duel, a house accidentally built backwards, and so much more! I think my favorite stop on the tour was the Moore House, where Van got to tell the story of the Lily Flagg ball­ — a party thrown for a cow! FUN FACT: You can see Van portray prize-winning Lily Flagg at the annual Maple Hill Cemetery Stroll in October. From architecture buffs to history lovers, these tours have something for everyone. They’re a great way to learn more about the parts of town you drive through every day and give you a new perspective about the county’s rich past! Plus, they are a great way to get outside and enjoy the gorgeous Spring weather. Walks are held in rain or shine, just not during heavy thunderstorms, so make sure you dress weather­ appropriate. The icing on the cake? These tours are FREE! The next tour will be Saturday, April 6 and Saturday, April 13 in Twickenham, and you can explore historic downtown Madison on April 20th and 27th.